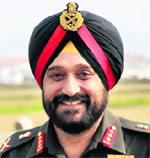 General Bikram Singh, has been appointed as the next Chief of the Indian Army. Ending months of speculation, the Ministry of Defence today made a formal announcement saying he will be the next Chief of Army Staff and will take over on May 31. The Haryana Government can finally heave a sigh of relief with Jats agreeing to call off their ongoing agitation demanding the Other Backward Classes status for the community. Results of the exit polls in five states predict a hung Assembly in Uttar Pradesh and a close fight in Punjab. Contrary to the claims of Congress chief ministerial candidate in Punjab and its former Chief Minister Amarinder Singh, the pollsters don't predict a sweep for the Congress in the 117-member Assembly. Having filed their review petitions in the Supreme Court against the apex court order of February 2 cancelling the 122 licences issued during the tenure of former Telecom Minister A Raja, the two affected startup telcos are of the view that the verdict has severe consequences for them and their stakeholders. Corporate Affairs Minister M Veerappa Moily indicated today the cash-strapped Kingfisher Airlines was "not professionally managed" and the onus was on promoter Vijay Mallya to convince the lenders. Asked if mismanagement was responsible for Kingfisher's troubled times and that the carrier should be allowed to fly into the sunset, Moily said, "That's not our (government's) desire; it (Kingfisher) has to survive". A local court today rejected a plea by Zakia Jaffery, widow of former Congress MP Ehsan Jaffrey, killed in the 2002 Gujarat riots, for making public the SIT report on the riots. Metropolitan magistrate MM Bhatt, while rejecting the plea, said the Special Investigation Team (SIT) is yet to submit material related to the report. Charges were today framed against a close aide of hardline Hurriyat leader Syed Ali Shah Geelani and three others, arrested for allegedly running hawala racket to fund banned terrorist outfit Hizbul Mujahideen in Kashmir Valley, by a Delhi court, paving the way for their trial. This winter the Indian subcontinent witnessed an unusual weather phenomenon associated with the retreat of monsoon system from peninsular India, which consequently led to the prolonged cold season in the north-western region and some areas of the Himalayas experiencing excess snowfall.